Tan (right) posing with SAP Malaysia Managing Director Bernard Chiang (second from right), Su and SAP staff Alicia Woo. Lee was not present at the award presentation ceremony. 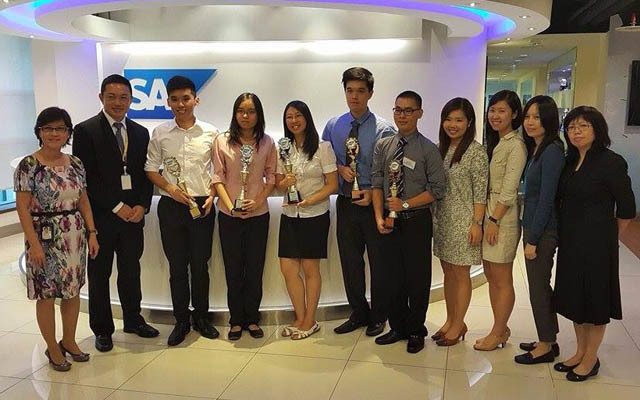 Team members Lawrence Lee Chun Pei and Tan Teck Yin emerged as the national champion in the SAP Lumira University Challenge held in Kuala Lumpur on 16 December 2014. They were one of the seven UTAR teams who made it into the top 10 finalists. Both Tan and Lee are students of the UTAR Faculty of Information, Communication and Technology (FICT). Their project, titled ‘War and Armed Conflict in Africa’, won the first place after edging out two other teams from Universiti Sains Malaysia and Tunku Abdul Rahman University College respectively. They bagged home a trophy, a Samsung Tab and a certificate of participation each. When asked about their secret of success, Lee said that good teamwork gave them a competitive edge over other teams. “Both Tan and I worked well to complement each other. Besides, we have faith in our competition ideas and that made us stood out with confidence compared to the rest of the finalists. 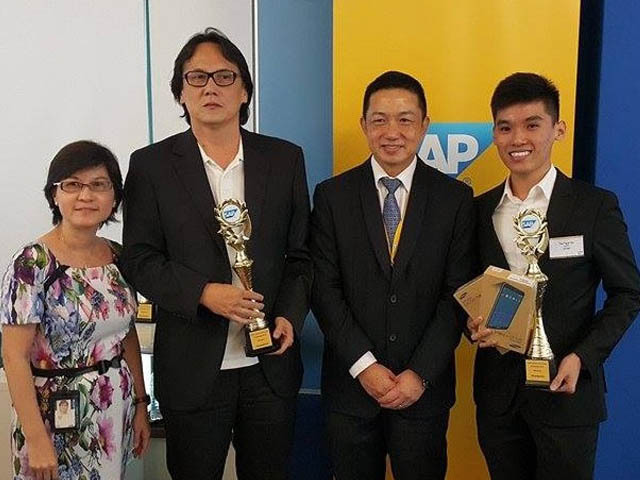 We were lucky to have won because other teams were very impressive as well,” said Lee, a third-year Bachelor of Information Systems (Hons) Business Information Systems student. Tan said that they performed well by not putting extra pressure on themselves. “We joined the competition with the aim to enjoy it as part of good learning and to gain exposure to new technology. We just wanted to have fun, learn about the SAP software and gain as much experience as possible. Of course, we were delighted when we won,” said Tan, a third-year Bachelor of Information Systems (Hons) Information Systems Engineering student. He praised Lee for giving brilliant ideas on how to transform raw data into useful information. Both Lee and Tan concurred that time management was their biggest challenge in preparing for the competition. “I enrolled in four subjects for this short semester and there were assignments to complete as well as time needed to prepare for the competition. I am lucky to have Lee as my teammate. His support helped me to juggle with my workload and to contribute to the team more effectively,” said Tan. Both Lee and Tan also expressed their appreciation to their mentor, FICT lecturer and experienced SAP consultant Su Lee Seng. “We want to dedicate our success to Mr Su. He gave us invaluable advice and guidance on how to refine our competition ideas. We would also like to thank our friends for giving constructive feedbacks as well as coming to Kuala Lumpur to support us in the finals,” said Lee. When asked about their advice for juniors who wish to join the competition, Tan said, “You must be responsible and stay strong when you encounter setbacks. We did not expect to complete our project within the given deadline, let alone enter the finals or win the competition. However, we kept going because we had a mutual agreement to be accountable to ourselves.” Meanwhile, Lee advised juniors to trust their partner and obtain more feedbacks from their mentor and friends. Along with the second and third place winners, both Lee and Tan will now represent Malaysia to compete in the regional round of the competition; against top three winners from South East Asia countries comprising Singapore, Thailand, Indonesia and Philippines. Organised by software leader SAP, the Lumira University Challenge 2014 aimed to bring awareness to economic, social and environmental issues using the SAP Lumira visualisation tool to present insights through data and propose ideas on how they can be improved. The national finals competition was sponsored by Hilti Malaysia.